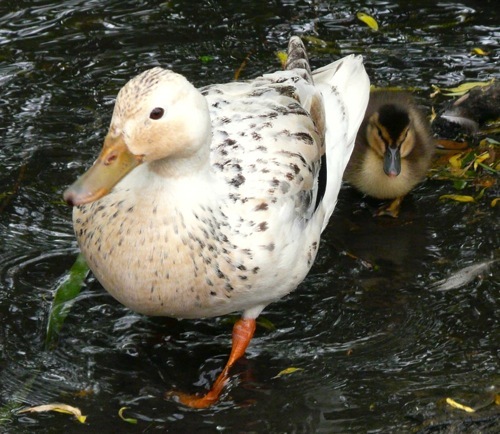 Homeschool Pond Study Mid-May – Ducklings! 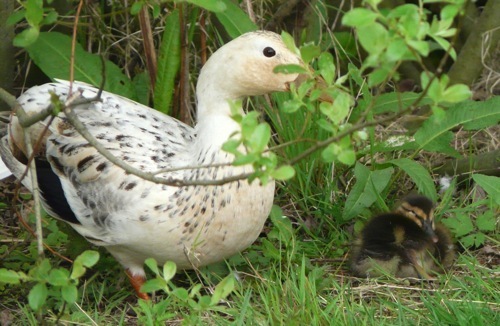 We’ve been so busy at our pond watching the swans and coots nest, we didn’t notice that the ducks had been quietly getting on with it until we visited this week to find a clutch of ducklings! 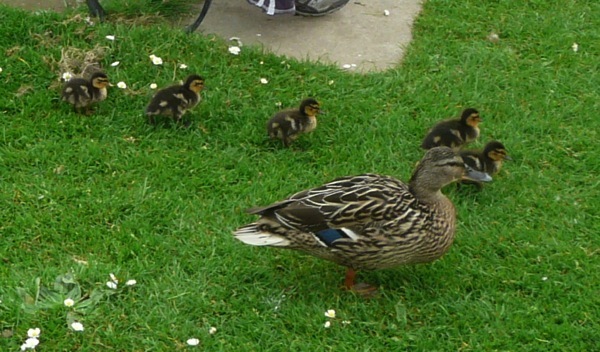 There were six ducklings on Monday. They were very tame so we were able to study them close-up. 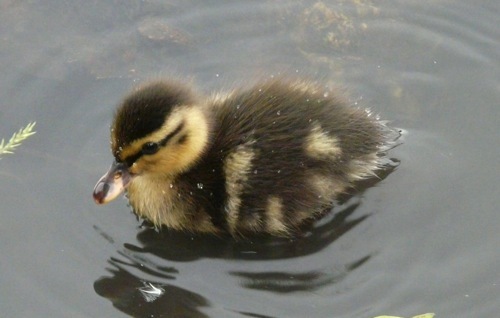 The children distinguished one that is the only one with pale stripes along the side of its beak. They’ve named it “Link”. The new arrivals were so cute we visited them again on Wednesday. This time there were only five ducklings of the original clutch. We were pleased to see our “Link” still among them. 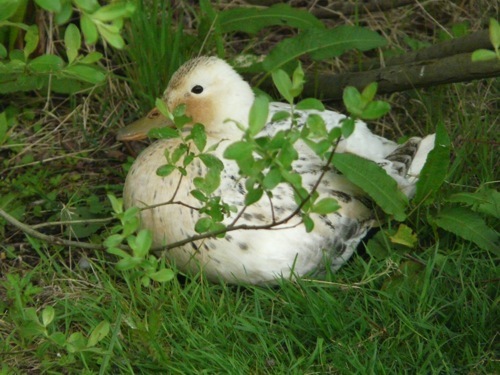 One of our favourite ducks – the one we haven’t been able to identify (a cross-breed?) 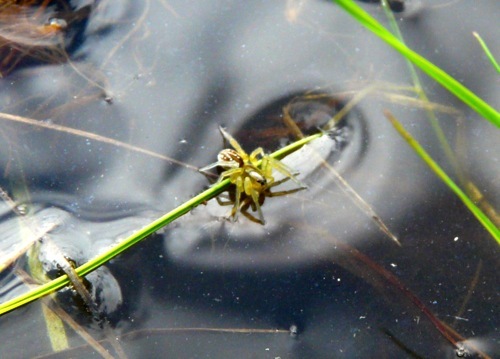 was nestled on the grass by the water’s edge. 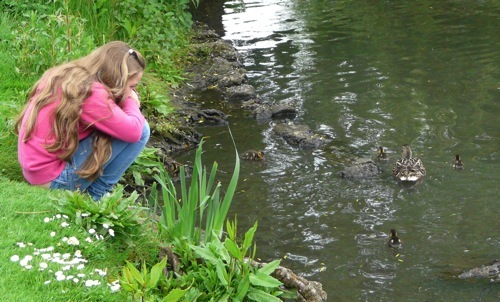 We watched her quietly for a while, and then she moved to reveal a single, tiny duckling underneath her! 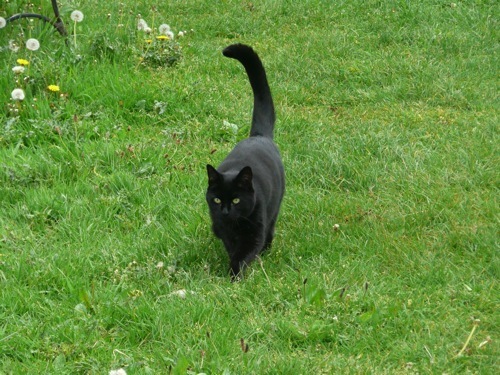 One animal we weren’t so happy to see at the pond edge was this black predator! 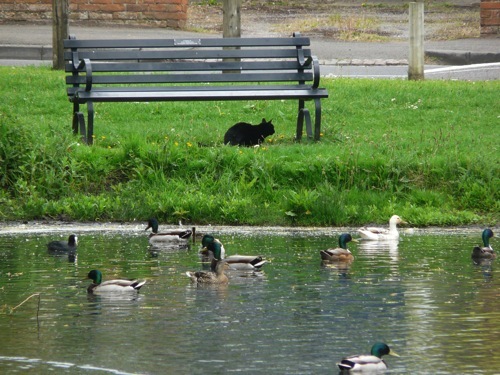 There are houses all around the edge of the pond so I guess it’s not surprising cats come and try their luck with the tame little ducklings. 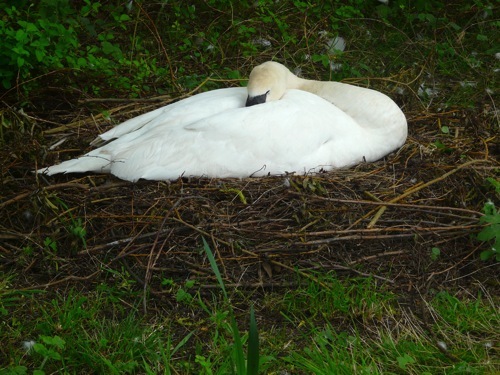 In other pond news, our swan is still nesting. 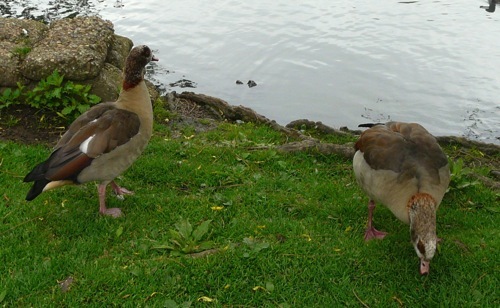 The pair of Egyptian geese are back, having disappeared for several weeks. 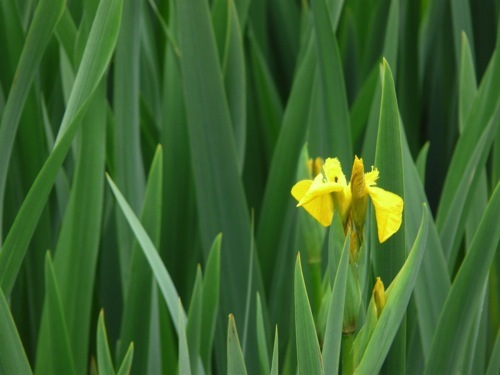 Yellow irises are beginning to bloom. We noticed lots of these (lily?) rhizomes in the shallows. 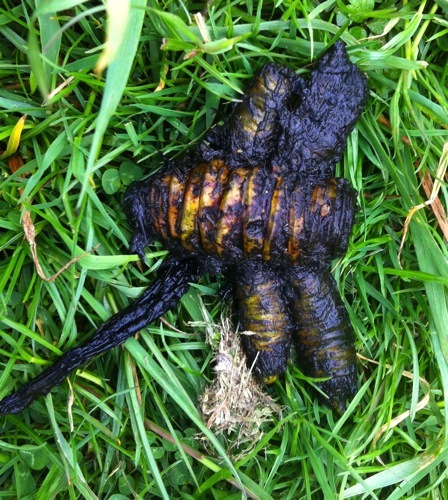 The children decided they were alien pods (very scientific, ahem). A few hundred yards from our pond is a much more secluded set of ponds. Only a few shy birds swim on these, and they teem with life. 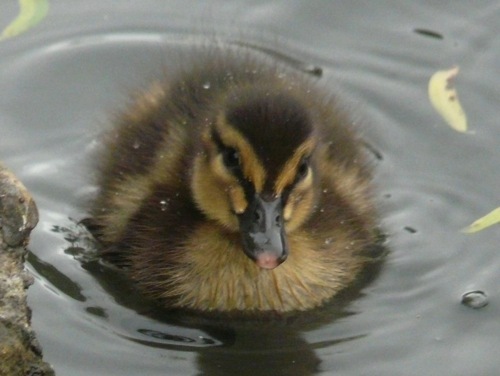 I wonder how many ducklings we’ll see next week? 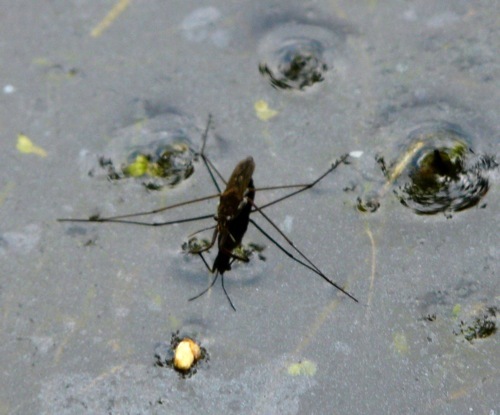 For previous pond study posts dating back to early March, see here. Thanks to AngelicScalliwags for inspiring us to begin our pond study. Oh, ducklings!!!! I’m so jealous! We’ve got a bit of nesting going on but no babies yet- I can’t wait, they are so darned cute! Hope we get goslings soon too. 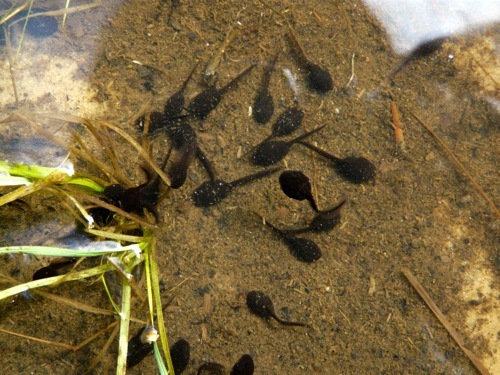 Thank you for sharing some beautiful pictures from your pond study, how fascinating and interesting for the children to experience this in ‘real life’ as opposed to looking in a book! There’s nothing like getting up close and down in the dirt, is there? Thanks for hosting Country Kids, Fiona. Such lovely photos and detail. Great to get some ideas of what I can do with my son. Thank you, Emma! I love my camera zoom! I hope you have fun at the pond with your son. 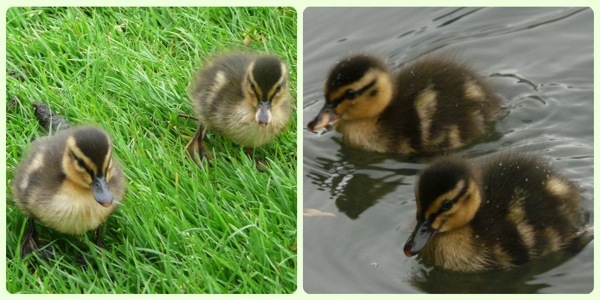 Those ducklings sent me into cuteness overload! The one pond nearby that had ducklings on a regular basis has been ripped up by “park improvements.” UGH. Some “improvements”! I hope you manage to find another source of cute feathered things nearby.